KAMP is a guest house, a renovated old building placed at alleyway of 'Houkan-cho Shopping Arcade', near the west entrance of JR Okayama station. It is intended to be a casual spot for backpackers from around the world. There are 3 types of guest rooms: mix dorm, female dorm and Japanese style private room for up to 2 people. All rooms provide free WiFi Internet connection. Kitchen, showers and restrooms are shared. The shower room is open 24 hours. Rental towel is 200yen, or 500yen for sale. Washing machine is 100yen per use with detergent. The Cafe&Lounge provides drinks and snacks, and also outdoor goods. 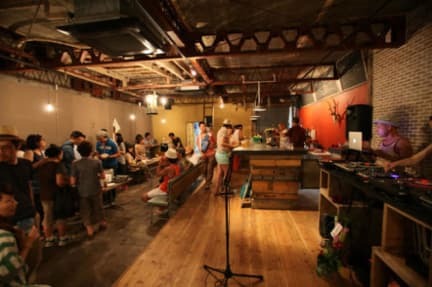 It is a place for people to enjoy art and music, and treasure their encounter with other people who stay at the guesthouse. Please contact us in case of late check-in time. It is not possible to check in after midnight. A hostel with a very nice location nice people nice music nice food nice drinks and good staff. The kamp hostel is a great place to stay. Everything was very clean, there are enough hairdryers and free shampoo and conditioner. 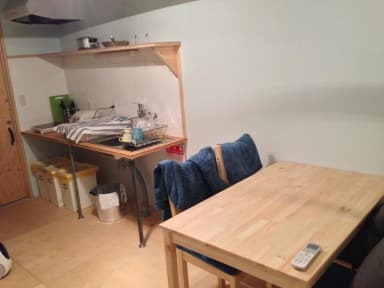 The kitchen is good for cookinh, you'll find everything there. I highly recommend this place!